Emotion, as usual, turns out to be the Titans' greatest asset and greatest weakness in Dan Abnett's Rebirth Titans Vol. 3: A Judas Among Us. For about the first time, Abnett seems to achieve the balance of heartfelt without being treacly, though unfortunately that comes at the end of this particular facet of Abnett's Titans run. There's a lot that's good here -- good cameos, good twists, good use on Abnett's part of DC's many, varied continuities. Judas runs too long, and then cuts off very suddenly, but this is probably Abnett's best of the bunch so far. The last book, Titans Vol. 2: Made in Manhattan, largely involved the Fearsome Five's attempt to recruit, and then steal the memories from, Bumblebee Karen Duncan; at the outset of this book, the Titans quest to get those memories back. That the entire "stolen memories" storyline turns out to be a feint might be problematic, but wrapped as it is in a slick "everything that's happened so far is connected" conspiracy, I didn't find it as bothersome as I think I would have otherwise. We knew, with the Key attacking the heroes last time, that there was another villain behind the scenes, but I didn't expect that extended to the Titans' encounters with the Five's Psimon and Titans Hunt's Mr. Twister, and the surprise mitigated any time wasted. Next, that secret villain turns out to be a future Donna Troy, now Troia; this was not totally surprising, but I thought Abnett sold it well. I might be even more enthused if this Troia had turned out to be an alt-continuity Troia, like the Titans who recently appeared in Detective Comics Vol. 5: A Lonely Place of Dying and Super Sons of Tomorrow; alas, it's just the future self of "our" Troia, but Abnett name-checks fast and hard: Imperiex, Savitar, Mageddon, Solaris, Neron, and more. It's all for show, and I try not to let such easy applause lines get me, but Abnett teases a fun future (of terrible villainous conquerors) that kept me hanging on Troia's every word. Judas therefore progresses with a lot of great reversals; first it seems like Omen might be the team's traitor, then it's Nightwing, then Flash Wally West dies, then it turns out Donna Troy is the villain from the future. This stream of setting up and knocking down a bevy of storylines gives Titans some much needed bounce. Key and Twister make unexpected appearances, as does Kid Flash Wally West and Titans Mal Duncan and Gnaark, plus the mention by Troia of all those other villains. At one point Nightwing sends Kid Flash to go round up other heroes -- the Justice League, the Teen Titans -- and had those appearances happened, it would have been icing on the cake. Instead Judas ends suddenly and goes on about an issue too long -- Abnett misjudges our interest in a prolonged Donna Troy/Troia fight -- but it's nicely energetic up to that point. In an abbreviated locked room scenario, and then again in the fight against Troia, Abnett reinforces the theme of the Titans being stronger together, that their friendship and emotional trust makes them effective. Abnett contrasts this with that their emotional rifts (somehow) release Troia to the present, and that returning Karen's memories of her family is the final catalyst. It's strange and ironic that what most people seemed to decry about the New 52 was the lack of emotional connection between the heroes and specifically the absence of the Titans, and now the book's only gone about twenty issues before DC is replacing it with a more formal, less Friends-esque Titans (that seems partially to resemble Young Justice: Outsiders, itself in the style of the more emotional Titans). I'm skeptical actually that Abnett isn't going to pivot the "New Justice" Titans back to a family (Tempest seems already scheduled to show back up), but still it's notable that what the Titans Rebirth delivered wasn't necessarily popular enough to stay despite that it had been so asked for. Dan Abnett's next Titans volume bridges his old and new runs, a kind of funny construction. Putting the three "Titans Apart" issues in this book would have resulted in an eleven-issue trade, probably too much, and DC couldn't have moved any of Titans Vol. 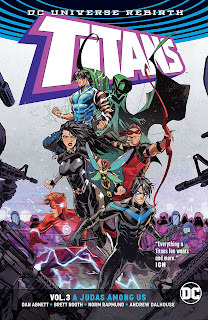 3: A Judas Among Us's issues back to the second volume because of the Titans: Lazarus Contract crossover in between. Anyway, I'm curious what Abnett's going to do so of course I'll be there; hopefully the better parts of this book are a sign of what's to come. My biggest gripe with this volume was that it felt too "hormonal" almost, with so-and-so kissing so-and-so who is actually is in love with someone else, etc. This sort of teen drama really killed it for me since a bunch of twenty-somethings should be beyond that sort of thing which seems more at home in a team of adolescents like the Teen Titans.